Apply the latest LP-Gas requirements for improved propane safety. The NFPA 58 Set combines rules with support from industry experts. Protect people and installations from a host of liquefied petroleum gas (propane) hazards and guard against failures, leaks, tampering, fires, and explosions. 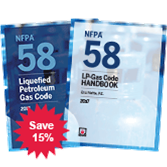 For 15% off, the exclusive 2017 edition NFPA 58, Liquefied Petroleum Gas Code and Handbook Set is the best value for knowledge about LP-Gas safety. This Set helps prepare you to do jobs right everywhere from residences to bulk storage facilities, pass inspections the first time, avoid costly job delays, and maximize protection against deadly hazards. When it comes to making sure propane installations are safe and up-to-code, nothing compares with the 2017 edition NFPA 58 and Handbook Set! Don't do jobs halfway. Team up for compliance with the 2014 NFPA 58 Set and get the latest LP-Gas rules PLUS expert application advice! Only one team fully prepares you to meet today's LP-Gas challenges and guard against failures, leaks, tampering, fires, and explosions -- the exclusive 2014 NFPA 58, Liquefied Petroleum Gas Code and Handbook Set. At 15% savings over what it costs to purchase them separately, it's your best value on invaluable knowledge that covers all the LP-Gas safety bases so you can do jobs right and pass inspections the first time, avoid costly job delays, and maximize protection against deadly hazards. Put the combined power of these essential industry resources to work for you to save time, money, and lives! When it comes to making sure propane installations are safe and up-to-code, two resources are better than one! Order the 2014 NFPA 58 and Handbook Set today and get total knowledge for total compliance.